You are currently browsing the daily archive for October 9, 2007. The rain did not dampen our spirits. The traffic jam all the way downtown was a minor hurdle we overcame. 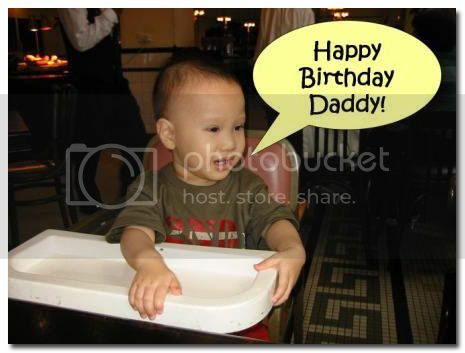 The gloominess was dealt a 180 degrees turn because it was Daddy’s birthday last Saturday (Yay! Cue Ethan boy to clap his hands with glee), and to celebrate, we all went to the E&O to savour the lunch buffet spread there. I had heard that the buffet there is very good and that the spread had a lot of variety, so I was curious to see for myself. It was once again good to visit the E&O because it brought back good memories of our wedding 3 years ago. The buffet lunch was at Sarkies Corner and as usual, I was charmed by the old world setting in the restaurant. The atmosphere was relaxed and very casual, with fantastic service from the restaurant staff. The food was marvelous, to say the least. I hardly ever take fried rice at buffets, but there was something about the one they served that was very tempting. And I had no regrets because I’ll have to say it was one of the best fried rice I have ever tasted. Even Ethan agreed wholeheartedly, and he ate quite a bit of it too. The generous garnishings of shrimp in the fried rice was a definite welcome indeed. Ethan also loved the pumpkin soup, and so did we. I loved it that they had 2 choices of soup: pumpkin and broccoli, both being healthy choices for the discerning diner. And for the not-so-health-conscious, there was also char koay teow available, the halal variety, mind you. Again, very generous with the shrimp, which were all so fresh and succulent, just the way we like it. I think I had about 10 shrimps in my one plate of char koay teow! I tell you, everything was so good; Hainanese chicken rice, lamb masala, grilled stingray and salmon, kerabu, oh and of course, any buffet would not be complete without dessert. 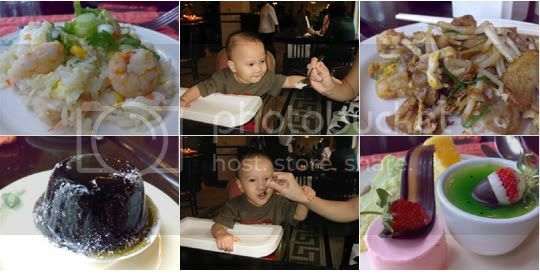 We enjoyed the guilingao, cheese cake, custards, mousse and ice cream. By the time we were done, we could hardly move! But Ethan, on the other hand, was very much playing the part of an energizer bunny, running all around the restaurant and the hotel lobby, checking out window sills, squeezing his way through every nook and cranny, waving at everyone around him, running to the lifts and waiting for it to open…well, he even got a lollipop from the restaurant manager!